About a month ago, I wrote here that Keegan Bradley was more deserving than Tiger Woods for a Presidents Cup captain’s pick by Fred Couples. I’d like a mulligan on that. Woods deserves to be on the team more than anyone. More on that in a moment. As far as the Bradley vs. Woods conversation, Couples made it moot a couple hours after my post went live. He announced on Aug. 25 that Woods was his first captain’s pick. U.S. Presidents Cup captain's pick. Now, with Bill Haas winning the Tour Championship and the uber-contrived FedEx Cup on Sunday, Bradley’s chances are even slimmer to make the U.S. squad for the President Cup. While trying to predict anything that Couples does is about as effective as a Bermudagrass divot, we have to think the U.S. captain is going to tap Haas on the shoulder after his win at East Lake for the final U.S. spot. Bradley, meanwhile, recently said he would be “devastated” not to make the U.S. team. Couples reportedly will make his final captain’s pick Tuesday afternoon. 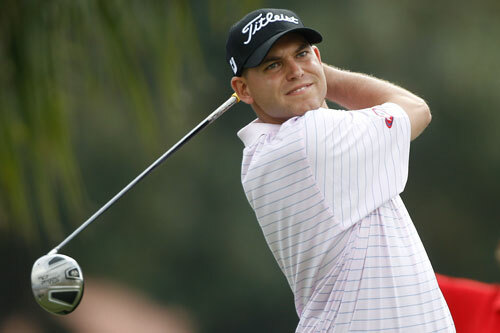 Will Bradley, the PGA Champion, be left out in the cold? Maybe not. Even if Couples takes Haas with the final pick, there is a chance that Bradley still makes the team. Steve Stricker, the top-ranked American player in the World Rankings at No. 4, might not make the trip to Australia for the Nov. 17-20 match play exhibition. The 44-year-old has an MRI scheduled for his left elbow for issues with a herniated disk and bone spur. Stricker wants to play, but he’s said he will defer to his doctors’ advice. There’s a chance Stricker could have surgery on his arm this week and shut it down for the year. Let’s get back to Woods. When I wrote that Bradley (and at the time, Rickie Fowler) deserved to be on the U.S. team more than Tiger does, I had forgotten what the Presidents Cup is. It’s an exhibition. It’s about promoting the game and the goodwill that accompanies it. the U.S. Presidents Cup team. This isn’t the Ryder Cup. Sometimes we (I) forget that. The Presidents Cup is merely a showcase for the game. The Ryder Cup is Us vs. Them, and national pride is at stake. Nothing is at stake in the Presidents Cup. Want proof? Back at the 2003 Presidents Cup, the score was tied at the end of the final day. Woods and Ernie Els were selected for a sudden-death playoff as nightfall approached. You might remember that on the third extra hole—in the dark—Tiger made a 12-foot par save, and Els matched it with a slippery six-footer. The playoff should have continued, but captains Jack Nicklaus and Gary Player were satisfied with the “showcase,” and they called it a draw. That would never happen in the Ryder Cup. And since the Presidents Cup isn’t the Ryder Cup, I’d like to reverse my stance on Woods’ participation. He most definitely should be on the U.S. Team. First, if the purpose of the event is to promote the game (read: get people to watch), then Woods is a no-brainer. No player in the last 20 years has meant more the game and the attention it receives than Woods. No player in the history of the game has done more to accelerate the game’s worldwide popularity. No one raised the amount of sponsorship dollars and prize money like TW did. More people will watch now that Woods is playing. It will be interesting to see how his game has progressed in the past months. Woods is always a story, and the Presidents Cup wants (needs) all the storylines it can get. I maintain that Bradley belongs on the team. I hope he gets the nod. But once I remembered what the Presidents Cup is, I am totally convinced that Tiger Woods belongs on the team as much (or more) than any American player. 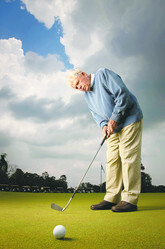 Jackie Burke’s putting stroke was as pure as love. From 1950-1963, he won 16 PGA Tour events. He was an absolute wizard on the greens and got halfway home to the Grand Slam in 1956 when he won the Masters and PGA Championship. it better than Jackie Burke. A five-time U.S. Ryder Cup team member (and the 1957 U.S. captain), Burke has given putting lessons to some of best who’ve ever rolled it, including Ben Crenshaw and Phil Mickelson. He recently gave one to the hack who writes this blog. A couple days ago I was at Champions Golf Club, which was founded by Burke and three-time Masters champ Jimmy Demaret. The historic club was the site of the 1967 Ryder Cup, 1969 U.S. Open and 1993 U.S. Amateur and is home to more single-digit handicaps than any club in Texas. I was there waiting to interview and shoot some photos of 17-year-old Kayli Quinton for an upcoming story in Texas Links. Back in 2006, Golf Digest named Kayli the most improved junior golfer in the state – boy or girl – and she recently won her third consecutive Greater Houston Junior City Championship. She has a great story. I look forward to sharing it with you soon. While waiting for Kayli, I ran into the 88-year-old Burke in the pro shop. “What’s your handicap now?” he asked. He had a putter in his hand. Then he gave me a lesson next to a rack of $100 golf shirts. He told me putting the ball isn’t any different than rolling it across the green with your hand. With his open palm, he punched me in the shoulder. It was like those old credit card commercials: Putting lesson from a Masters champion? Priceless. The next day in a media event, I made almost every putt. One of my all-time favorite golf pro stories involves Jackie Burke. He was giving a tour pro a putting lesson. They were working on four-footers. When the pro missed one, Burke slapped him across the face – hard. The pro recoiled, and then asked why Burke did that. They didn’t just break the mold after Jackie Burke. They destroyed it. Meet Connor Black, the top-ranked 15-year-old in the U.S.
Editor of Texas Links Magazines, publishers of Houston Links and DFW Links. Find monthly copies at your local course. Thanks for reading the Chasing Birdies blog, brought to you by Texas Links Magazines and www.TexasGolfOn.com. If you have an idea for me, please email me at mbutton31@gmail.com. Simple theme. Theme images by michaelmjc. Powered by Blogger.